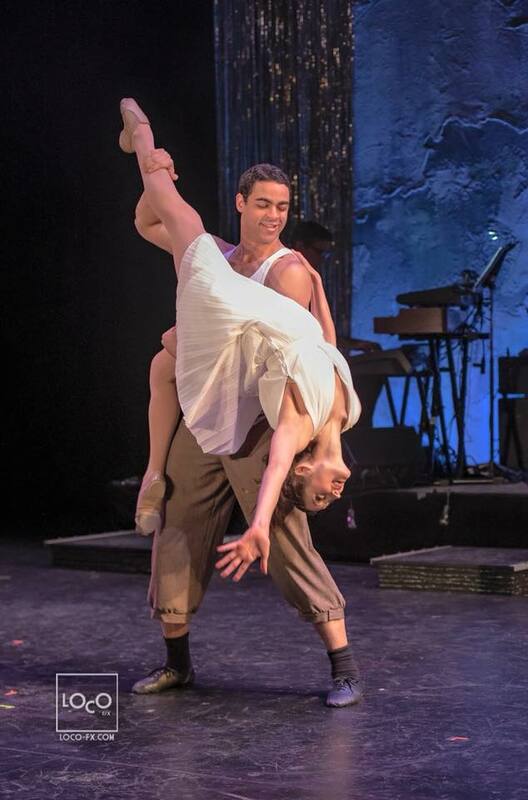 In the past five seasons, Collide Theatrical Dance Company has brought us original stories from various historical eras, as well as adaptations of classics like Romeo and Juliet. 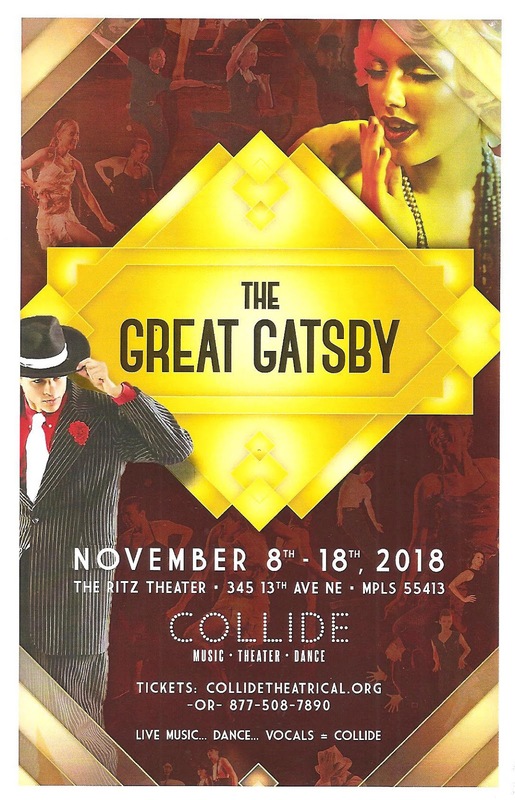 Their new show is an adaptation of the most well-known novel by Minnesota's own F. Scott Fitzgerald, The Great Gatsby. What makes Collide unique is that they tell their stories entirely through movement and music, with few or no words. Their "original Broadway-style jazz dance musicals" are a collision of music, dance, and theater. In other words, an excuse for this busy theater blogger to watch pretty people dance prettily, while telling a theatrical story. Combining perfectly chosen pop songs performed by a live band and singers with thrilling dances performed by the talented company of dancers, they're able to convey all of the emotion of the story (with plot summary printed in the program if you care about the plot). The Great Gatsby is a great example of this as they tell the story of these beautifully tragic and tragically beautiful people. Artistic Director/Choreographer Regina Peluso and Director Joshua Campbell created the piece, with Musical Direction by Doug Rohde who leads the onstage four-piece band. They've structured the 90 minute with intermission show (which would play better as 75 intermission-less minutes) as a series of dances that take us through the events of the novel. Each dance is accompanied by a well chosen pop song, sung by one or both of the amazing vocalists who also function as characters in the story - Sam Adamsson as Gatsby's friend Nick, and Katie Gearty as Daisy's friend Jordan. We see flashbacks of Gatsby and Daisy falling in love, Daisy marrying the wealthy Tom, and Gatsby making his fortune in bootlegging and other illegal activities. There are the lavish party scenes featuring the entire company, and emotional duets as Gatsby and Daisy find their way back to each other, and Daisy makes her choice. If you're wondering how they recreate the famous car accident at the end, they use a little artistic license to tell the same story in a different way. But don't worry, this is a musical, so after everyone dies, we still get to have a fun curtain call dance number to send you off into the cold night feeling a little less melancholy that this story usually leaves one. This is where words fail; I'm a theater blogger who doesn't know how to write about dance. Except that it's fantastic. Regina Peluso's choreography (with additional choreography by Heather Brockman, Kaleena Miller, Andrea Mislan, and Rush Benson) captures the spirit of the Jazz Age, as well as the emotions of the story. And it's really fun to watch. The lead dancers are all wonderful and perfectly capture their characters with no words, just movement and expression. Patrick Charles Jeffrey is the tall and brooding Gatsby, Grace Janiszewski is the lovely but selfish Daisy, Jarod Boltjes is the haughty and careless Tom, and Chelsea Rose steals scenes as Tom's mistress Myrtle. The company is dressed in gorgeous '20s era costumes (designed by Regina Peluso and Rebecca Abroe) - lots of sequins and fringe for the women, well-tailored suits and fedoras for the men - that still allow freedom of movement. The Ritz stage is bare and open to allow maximum space for dancing, with four raised boxes for tap dancing that light up with the rhythm of the dancing. One final added element is aerialist Heather Haugen who performs at Gatsby's big parties. The Great Gatsby continues through November 18 only and is close to selling out, so make plans soon if you want to catch it. And watch for their spring show, an adaptation of Oscar Wilde's The Picture of Dorian Gray at Park Square Theatre. "The Great Gatsby" November 8-18 2018 at The Ritz Theater from COLLIDE THEATRICAL on Vimeo.